Organization of your stay in Venice. The enoteca organises basic courses on wine during the month of November. For further information, please consult the Italian version of the website: Italiano - Vantaggi - Arte / Cultura. 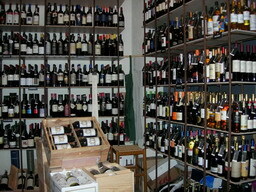 The "Bottega d'Angolo" (Corner Shop) belongs to two young, but experienced, partners in the glass field. They offer, as is their custom, only merchandise that is hand made by Muranese glass masters of renowned ability. Thanks to this business policy, and to the continued collaboration of the glass masters, they are able to offer an excellent variety of exclusive pieces which respect the traditional Venetian glass making techniques but which at the same time keep pace with changing contemporary design. Glass replicas of the original lamps designed by Mariano Fortuny (1871 - 1949). Arte di Venezia offers contemporary and classic Venetian glass. In their shop in the centre of Venice, as well as on their website, you will find only original "murano glass". The gallery exhibits artworks from the finest emerging and established artists and master glassmakers working today. The Domenico Tramontin e Figli boatyard was founded in 1884. It has built gondolas for - amongst others - the Italian Royal Family, the Prefecture, the Venice Municipality, the City Police and the Carabinieri, and has featured in numerous international publications and documentaries. The Tramontin boatyard has carried out a number of prestigious conservation works for gondolas over a hundred years old, including the oldest gondola in the world that belonged to the poet Robert Browning and is now kept at the Mariner’s Museum in Newport, Virginia. L'Offerta Musicale is a group of young Venetian professionals, chosen among the best graduates of the last decade. Many of them have already distinguished themselves by winning Italian and international competitions. The repertoire of the orchestra is large and varied, from the Sixteenth Century up to modern classical music, they especially perform many works from the seventeenth and eighteenth century. Paolo Olbi makes use of a lot of types of leather for his artistic book-bindings : he chooses them among the ones produced by craft workshops and dressed in accordance with the most classical handicraft tradition and inspired by the great Venetian bookbinders of the past. Ebrû, a Turkish word coming from the Persian ebri "cloudy", is the term designating the particular technique used to decorate paper with colourful motives imitating the veins of stone or marble. This procedure, imported from Persia around the half of 1500, underwent an extraordinary development in Turkey and was even diffused in Europe during the XVII century. Livio De Marchi was born in Venezia where, still a child, he worked on ornamental sculpture in the Venetian tradition in the workshop of a crafting and in the meantime he studied art and drawing at the “Accademia di Belle Arti” in Venice. His activity starts there, displaying at once an astounding skill in moulding materials.